The DOW finished last Friday in a weak position in terms of the intraday structure. It was not able to close above the previous day’s high, which is also last month’s high. But it was able to close above the 200-day moving average and as well as the downtrend line that was established from the October selloff. The weekly cycle is bullish. It is entering the 6th bar in the weekly cycle. It is also facing a key resistance at 25587. It started the 2nd daily cycle on 01/28/2019. 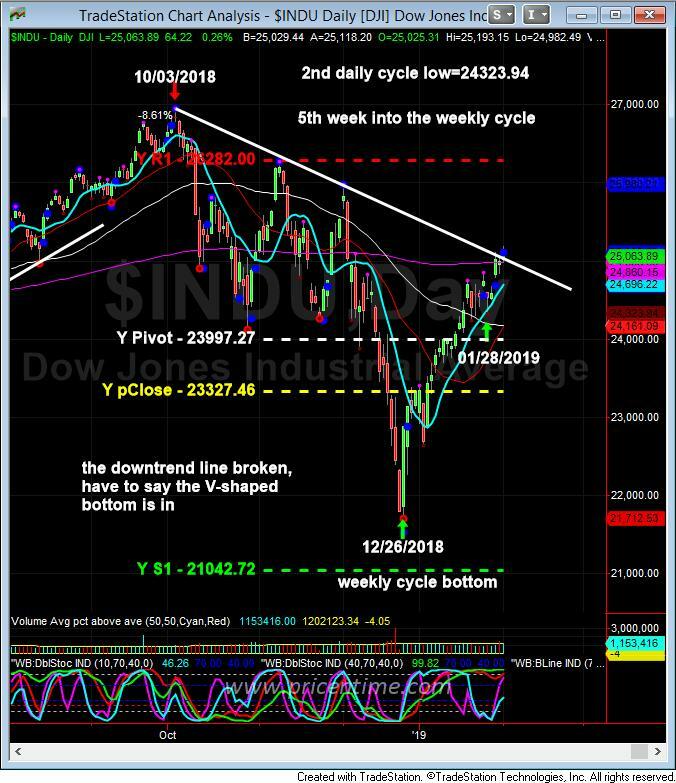 If the daily cycle low at 24323.94 is violated, then it means the weekly cycle is turning into a bearish position. So between 24323.94 and 25587, the market is contained in a neutral position. The S&P 500 and Nasdaq are under the 200-day moving average. In a traditional sense, this is still a bear market rally since it is rising from the position of underneath the 200-day moving average. The 200-day moving average will provide significant resistance of this rally. The DOW is only comprised of 30 stocks, it is relatively easier for the index to exceed the 200-day moving average than pushing 500 stocks. The S&P 500 200-day moving average currently is at 2741. It has to trade above this number in order for the market to have a sustained up move. So be very focused on current range of 24323 to 25587. If it goes above the range, it’s bullish. If it goes below the range, it is bearish. The big picture is still bullish long term. We are in no way facing a market crash like 2000 or 2007 top. The December low is a V-shaped bottom that is a 4-year cycle price low. We will be fully invested when the next weekly cycle low occurs. This entry was posted	on Sunday, February 3rd, 2019 at 9:16 pm	and is filed under Forecasts, Stock Indices. You can follow any responses to this entry through the RSS 2.0 feed. Both comments and pings are currently closed.